It's always amazing to see how fans all over the world come together to celebrate the fanaticism over superheroes and movies alike. 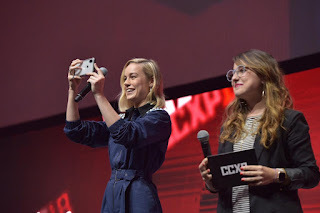 As Brazil's Comic Con Experience is under way Marvel Studios had an exciting panel for all the fans in attendance. Brie Larson, who stars as Carol Danvers/Captain Marvel in the upcoming Marvel Studios’ "CAPTAIN MARVEL," participated in a panel at Brazil’s Comic Con Experience (CCXP), which is currently being held in São Paulo. "Captain Marvel is set for release in 2019 and for the fans the movie cannot come to theaters soon enough.